The most exciting and comprehensive book yet in the bestselling DC Comics how-to-draw series! From the bestselling DC Comics Guide series, this is the essential resource for aspiring comics creators looking to make intriguing, action-packed comics like the experts at DC Comics. Going beyond the typical art and writing lessons, this book shows readers how to take full advantage of comics' sequential visual storytelling possibilities. 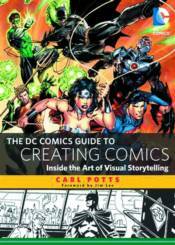 Writer Carl Potts presents key principles and techniques for crafting exciting professional-quality comics. This behind-the-curtain look at the DC Comics creative process is a can't-miss opportunity for aspiring comics creators, whether they want to work for DC Comics or invent their own unique comics creations. Introduction by Jim Lee.